The Eurozone Is Still Doomed, Isn’t It? themselves and abide by Germany’s austerity dictates — see yesterday’s post for more on this). This is, of course, not the first time the euro has been rescued. We’ve been treated to a long procession of similar announcements before, and I frankly thought that investors had grown a little more jaded toward them by now. But apparently not. They still want to believe. You can’t maintain persistent capital flow imbalances in a fixed exchange rate area. The fixed exchange rate area breaks up. In other words, Europe abandons the euro, the periphery countries readopt their old national currencies, and then promptly devalue them. The capital flow imbalances have to stop and turn around. This would require that Germany start running a trade deficit and the periphery countries start running trade surpluses. The capital flow imbalances have to be institutionalized permanently. This can happen either via permanent fiscal transfers from core to periphery (similar to the way the United States maintains permanent fiscal transfers from rich states to poorer states) or via central bank bailouts. Let’s take these one by one. European leaders swear on their mothers’ graves that #1 won’t happen. 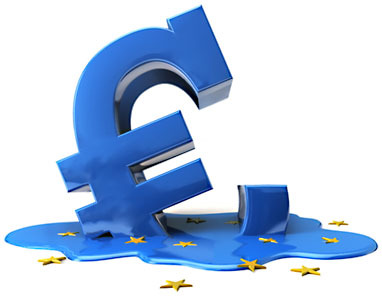 They say the euro is “irreversible.” There’s no sign at all that #2 will happen either. Germany has shown no willingness to abandon its cherished trade surplus, no willingness to tolerate higher inflation, and no willingness to pursue any other course that falls under the general rubric of “internal devaluation.” And option #3 is off the table too. Europe’s rich countries have demonstrated no desire to permanently subsidize their poorer neighbors, and their voters would revolt if they tried — something that’s pretty understandable given the vast sums that would probably be required. Likewise, on the central bank front, today’s ECB action is a temporary measure. No one thinks they can (or should) keep it up forever. So we’re in the same place we’ve always been. Either the eurozone breaks up or else capital flows between the core and the periphery have to be reversed. The former is supposedly off the table and the latter is politically impossible. So what gives first? My guess is: the eurozone. That seems to be what Wall Street increasingly believes, too. Unless I’m missing something, of course. Am I?